Gypsy Kitchen is a gourmet wine and cheese shop near where I work. I like to stop by for the Friday evening wine tastings and chat with the owner, Lisa. 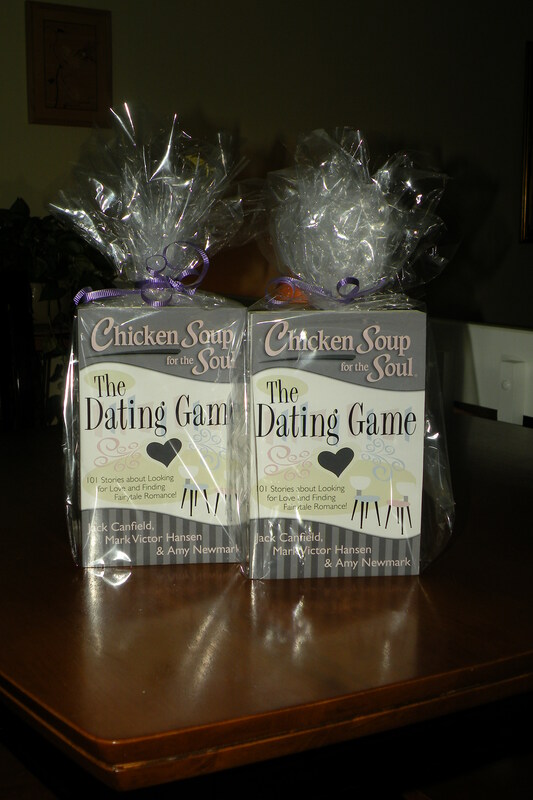 The other day she told me about the special events the wine shop hosts–bridal showers, singles events, girls’ nights out–and I got an idea: why not offer a copy of Chicken Soup for the Soul: The Dating Game, in which my story, “Short Distance Romance” appears, as a door prize. Lisa said she’d be happy to do it and that she would mention me along with the door prize in an upcoming issue of her newsletter. I’m also giving a copy of the book away as a door prize for the next meeting of a women’s club I belong to in Boston. I’ve autographed the books, tucked my business card with my blog address on the page where my essay appears, and placed the books in decorative wrapping. Door prizes are a great vehicle for promoting your writing and getting your name before the public. What do you think? If you have a great idea we writers can use to raise our profiles, I’d love to share it. This entry was posted in Publishing, Writing and tagged Chicken Soup for the Soul, door prizes, essay, Gypsy Kitchen, story. Bookmark the permalink.